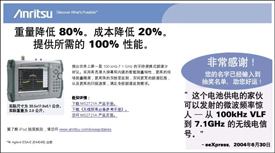 Marketing to Asia - Beasley Direct and Online Marketing, Inc.
Anrtisu is a telecommunications and networking test and measurement equipment company. We wrote and designed the US English version of this campaign and then worked with a third party translation company and their Asia marketing department to produce the campaign in Korean, Japanese, and Simplified Chinese. We then received lists from those international marketing departments and set up the email and landing pages in ExactTarget to send. Is your company marketing to Asia? Beasley’s experienced experts can convert your existing campaigns for use in Asian markets. Call us now.